Most Southern Californians are familiar with the sign on the I-10 freeway indicating Palm Springs to the right, other desert cities straight ahead. Depending on your orientation, Palm Springs may conjure up a scene of tony gay culture, or a bastion of old–guard Republican conservatism. In the case of Jon Robin Baitz’s fine play, “Other Desert Cities” is the road not taken by Brooke (Robin Weigert) and Trip Wyeth (Michael Weston). Dutifully, with varying degrees of trepidation, the two 20- and 30-something siblings turn right onto highway 118 to Palm Springs for a holiday visit with their parents, Polly (JoBeth Williams) and Lyman (Robert Foxworth). The senior Wyeths are the very embodiment of old-guard conservatism. Still handsome Lyman, a B-grade movie star in his day, was anointed ambassador back in Reagan’s presidency. Polly looks to her pal, just-say-no Nancy, for guidance and fortitude. No hair of her perfect blond coif is ever out of place. They live in one of those ubiquitous, gated, desert, golf communities, in a late midcentury house with requisite walls of Palos Verdes rock, and faux bamboo dining chairs no gay decorator would ever countenance. Life revolves around the clubhouse and all must stay tidy and sunny behind the community’s walls, where most of the other residents probably have similar chairs and hairdos. But all is not sunny behind the family facade. Daughter Brooke published a successful novel and has spent the subsequent six infertile years fighting a suicidal depression of her own occasioned by her older brother, Henry’s, suicide. He outright rejected his parents’ values, dropped out, drugged up, and lived in a Venice “squat” with a group of “Weathermen-like” protestors whose activities culminated in a bomb that killed a janitor. Subsequently, Henry jumped from a ferry north of Seattle, his body never found. Brooke considered him her best friend and blames Henry’s suicide on her parents and their rigid rejection of him. Her parents have buried themselves in the desert, avoiding coming to terms with his life or any blemish in their own. What does a writer write best about? What he knows. And what is Brooke most certain she knows intimately and accurately? Her family, of course. She has brought the manuscript of her soon-to-be-published memoir, an excerpt of which is to appear in the next New Yorker Magazine. This does not sit well with mommy and daddy, especially not with just-say-no mom. What does a family and close friends of a writer fear most? The tell-all memoir, of course. Younger brother Trip, a reality TV producer, just wants everyone to get along. Much has been made of “Other Desert Cities” as embodying the divisiveness of American politics today. Political comments like Silda’s notwithstanding, this is more a play about how families tear apart, while remaining bound ever more closely together, than it is about the mess demagogues in either party have brought to the national scene. Brooke’s manuscript is the smoking gun that threatens to explode the delicate balance of family powers: adult children returning home as though adolescence is their permanent state, parents ceding no ground to their children as independent adults. It resonates because we have all been on at least one side of that fence, if not both. Baitz is a gifted writer whose dialogue is rich with few wasted digressions or repetitions. Language and story share equal importance. Act I of “Other Desert Cities” is one of the most tightly written and satisfying pieces of theater I have seen in years. The denouement in Act II left my head spinning and uncertain of exactly what had just happened. How often have I bemoaned the lack of an editor to trim material down? This is not the case for “Desert Cities.” I would have happily sat for further exposition. With one exception, Robert Egan’s direction matches the precision of Baitz’s material. JoBeth Williams’ Polly could have just stepped off the greens of the Wilshire Country Club. Robin Weigert perfectly embodies the narcissism of depression and Robert Foxworth the vapid dignity of the empty suit. But Jeannie Berlin as Silda is the one flaw in an otherwise outstanding, balanced ensemble. While the rest of the cast displays almost perfect timing, Berlin seems to be woodenly reading— a pity, as Silda, down and out with nothing left to lose, has some of the best lines. 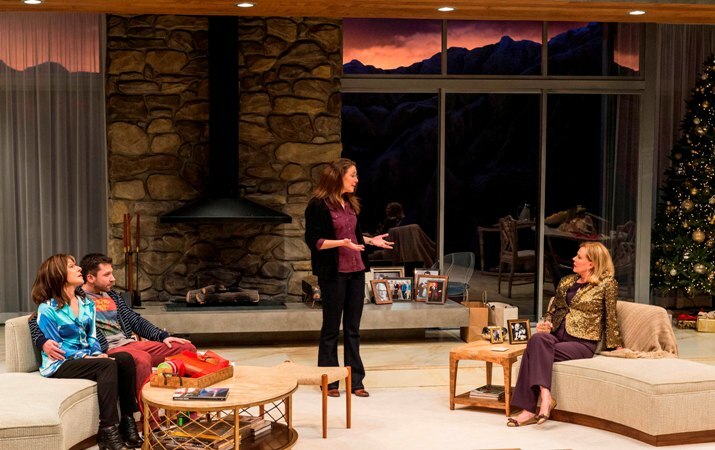 While Brooke may have regretted the road not taken, we the audience can only rejoice her turn to Palm Springs and the opportunity for us to see the grownup variety of theater that has been increasingly scarce over the past several decades.